Bring data to life with state-of-the-art visualization tools. Bring data to life with state-of-the-art visualization tools for displays, mobile and web. 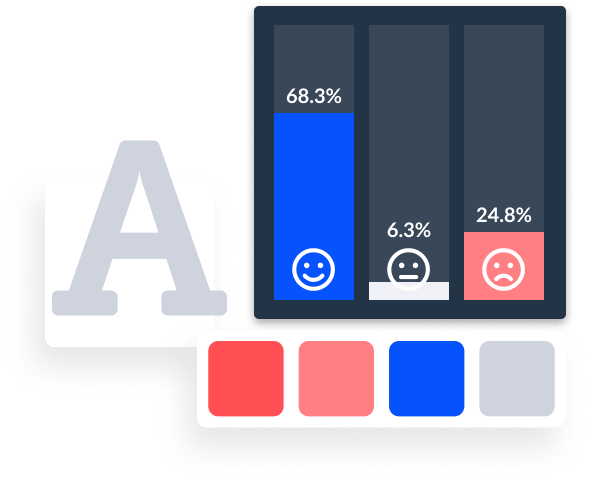 Use our powerful display builder to create stunning visual storylines from a large widget library including charts, maps, multimedia content, newstickers and more. Turn social, news and other live data into an experience that people will be able to connect with. 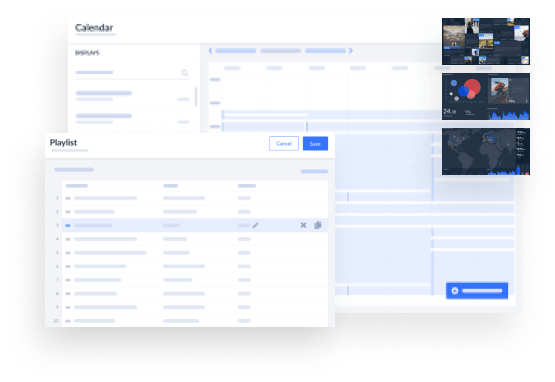 Simply setup stunning display visuals with custom templates, drag-and-drop design tools, rule-based scheduling, multi-screen and scene support, and monitor all your displays in real-time. Bring all your data to live with engaging visuals thanks to individual layouts, scenes and multiple widgets to choose from. 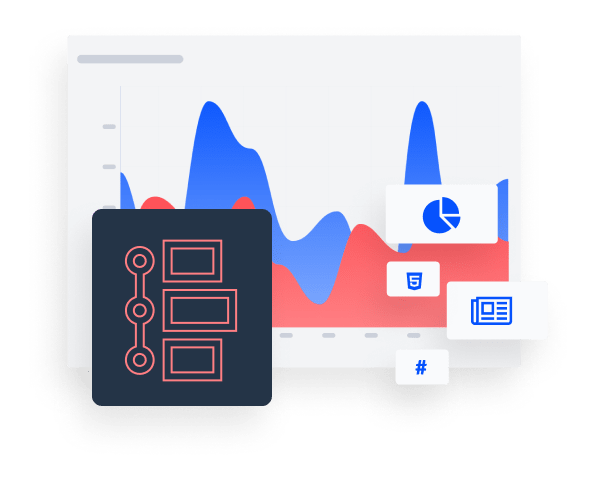 Combine live data charts with your own multimedia content and break your data story down into multiple parts that are quick to grasp. Advanced design options ensure your screens don’t look like a website with text hard to decipher, or like they belong in your competitor’s office. Customize everything from fonts, to colors and transitions, no coding required. Plan your content for the day, week, months or year, while data is always live and relevant. Organize your displays in Playlists and simply check your display calendar to always know what’s scheduled to show. 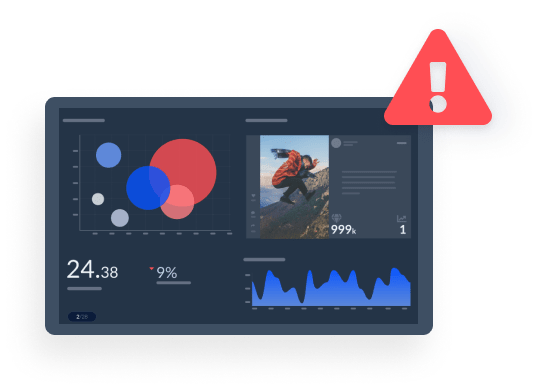 Know what is going on with your Data Displays with a central monitoring dashboards that shows you live screenshots and alerts you of any issues that might arise. 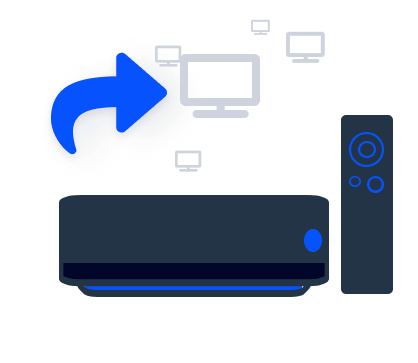 Reload data and views or restart the hardware from the web app with a simple click, no need to bother IT. Live data needs an always on internet connection, but if there is ever an issue with that, we’ve got you covered. When the internet connection is lost your Data Display will show the most recent content it was showing before the connection was lost until the internet is back. If you don’t have a digital signage setup or your existing system is outdated, we can get you setup with our plug & play players that you can connect to any display and that can power video walls with up to 6 displays without additional hardware required. Plug in the internet, connect the power cable and you’re ready to go. Set display uptime from your dashboard and decide when updates are applied to insure uninterrupted play when your displays are in use. Digital Signage responsibility often lies solely with IT Departments, since management and configuration is highly complex. Bring display control to your department to ensure your displays are always relevant and up to date.